The arts in prison has been a longstanding commitment of the Monument Trust and the organisations in the Monument Fellowship. 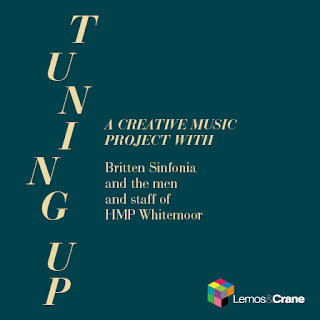 Tuning Up is an ongoing project in HMP Whitemoor with Britten Sinfonia using orchestral repertory to engage and develop prisoners' music skills and enhance their relationships and wellbeing. The partners in Tuning Up were Lemos&Crane, Britten Sinfonia, HMP Whitemoor and Orchestras Livee. Our hypothesis was that Tuning Up in all its aspects would increase interest among the participants in prison in unfamiliar musical forms from the orchestral repertory. The focus on orchestral repertory rather than more familiar musical forms like rap, R&B or hip hop was with the objective that engagement with classical music would be unapologetically educational, stretching and aspirational. We also wanted to develop musical enthusiasm, commitment, skills and interest in future development of their musical interests and skills. In addition to these musical benefits, we also hoped for other personal and socially beneficial outcomes including increasing confidence and self-esteem, improved mental health and coping mechanisms for prison life during a long sentence, better communication and collaborative skills and empathy among residents and between residents and staff and a sense of achievement in their own eyes and in the eyes of family, friends, other residents and prison staff. We also hoped there would be benefits for prison life generally: more co-operative residents with new interests, better social skills, more positive relationships with staff and other residents as well as higher levels of staff motivation and engagement with creating and enhancing a more rehabilitative culture. Our ambition was that the programme would also be personally and musically developmental for the musicians, enhancing their creative skills with a community and in a setting that was new for most of them. We also hoped that over the long term programmes such as this could contribute to changing public perception of offenders' skills and abilities and engender more understanding of prisons, those living in them and their lives. You can read the full evaluation of the first phase of Tuning Up here and see if we met our ambitions. Clinks and the National Criminal Justice Arts Alliance (NCJAA) are curating responses to the question “What should happen to people who commit criminal offences?" Clinks is part of a collective of organisations, the Monument Fellowship, each funded through the legacy grants of the Monument Trust which has now closed. In addition to each organisation doing what it is grant funded for, we work together to create a body of work over the course of six years which will provide a legacy for the criminal justice work of the Trust. We pose a question each year which we collect contributors’ answers to. Last year's book, Curing Violence, was curated by Centre for Justice Innovation. We are now actively seeking contributions to a book allowing for differing, contrasting and contrary viewpoints. Contributors can either provide the piece themselves or be interviewed by CEO Anne Fox or a colleague from Clinks. There is no minimum word limit but the maximum is 2,000 words. If you would like to be considered, or nominate someone else, please send a brief description of what you’d aim to cover (no more than 500 words), to anne.fox@clinks.org marked “Monument Fellowship question” by 31st January 2019. The deadline for contributions is early May 2019. Clinks is a proud member of the Monument Fellowship –founded to carry on the legacy of the Monument Trust in criminal justice when the trust closes. Working together the Fellowship’s members aim to engage a broad range of people on issues which require real thought if we’re to reduce the number of people going, and returning, to prison. We’ve chosen to do this by setting an annual question which we invite people to answer in a variety of ways including through contributions to a book, curated by a different Fellowship member each year. I write this blog as this year’s curators The Centre for Justice Innovation prepare to launch the book answering the question “How can we be a less violent society?” An answer I’d offer to this question is “by allowing voluntary organisations, especially those which are community based and specialist in focus to flourish”. In the United States of America Sharkey et al published research in 2017 that showed, tracking crime rates over a 20 year period, a positive correlation between the development and presence of non-profit organisations in local communities and the reduction in their violent crime rates. This is something we’ve an instinctive belief in at Clinks because we understand, usually from qualitative sources of evidence, the impact that charities and social enterprises have on the lives of the people they support and the communities in which they live. The criminal justice system disproportionately impacts the lives of people in poorer communities and people protected under the Equalities Act (2010). This is true both for victims of crime and those who find themselves on the other side of the dock. Organisations in the sector are often of and for these communities of place or interest. As such they have specialist understanding of their communities’ needs and appropriate responses to them. For example, 25% support women, 24% support young adults and 16% work to meet the needs of black, Asian and minority ethnic (BAME) people. Starkey’s research reinforces our belief that given the freedom and flexibility to design and deliver responses to need as they see fit these organisations can achieve remarkable outcomes that lead to inspirational change. But it brings into sharp relief some of the challenges facing the sector at this time because the very things that they need to do to support their communities and the people in them are under threat, primarily due to lack of funding. We’ve published our latest State of the sector research. In our analysis we’ve found a continuing pattern of the smallest and more specialist organisations facing real uncertainty. This throws into question their future ability to survive and thrive and provide the support that’s needed in their communities. The English and Welsh voluntary sector is predominantly locally based with 47% of organisations delivering their services locally, compared to 35% regionally and 35% nationally. English and Welsh criminal justice voluntary sector organisations are smaller than those in the wider voluntary sector. 25% of specialist criminal justice organisations have an income of less than £100k, compared to 12% of non-specialist criminal justice organisations; whilst 26% of specialist criminal justice organisations have an income of more than £1m, compared to 35% non-specialist criminal justice organisations. Sources of funding are also important and impact on what organisations can do and how they work. Voluntary income, including grants, is essential for small, specialist criminal justice organisations to respond flexibly and innovatively to local need. We believe that grants are good. They allow organisations to be flexible and responsive. Whereas contracts for services are often prescribed by commissioners rather than developed by organisations who have the intelligence and expertise to identify, understand and address needs in their communities. So, what are the implications? What trends require concerted effort to reverse if we’re to ensure that the needs of communities in England and Wales are well met, which may in turn lead to the same reductions in crime, seen in Sharkey et al’s research? We need to allow and enable communities of place and interest to mobilise and support the formation, development and sustainability of not for profit organisations responding to communities’ needs – the US experience points to the importance of organisations forming following the mobilisation of local people concerned about their community in the face of rising crime and violence. Action of this kind creates empowered and autonomous communities which in turn leads to the social capital that is most likely to produce the positive influence of informal social control that is described in the research. We need to understand that real change takes time – funding and support of one to three years for projects and initiatives will go some way towards supporting local organisations but transformative longer-term change and building the trust needed to achieve it will need longer term investment. We need a radically different approach to ensuring that BAME led organisations, possibly the most vulnerable part of our sector at this time, can lead responses to need within BAME communities. Clinks research has shown that, despite sustained and ongoing over representation of, and poorer outcomes for, BAME people at every stage of the criminal justice system, BAME led organisations are more likely to be at risk of closure than other organisations in the criminal justice system. Alongside this, BAME people, especially young BAME people, are also more likely to be victims of crime including violent crime. These issues merit a community response from a well-funded and autonomous BAME led sector able to advocate for and put resource into ways of building trusted relationships with and services for young people. Yet while the vulnerability of this part of the voluntary sector has been recognised by infrastructure organisations, funders and policy makers it’s this type of organisation that we consistently see missing out on funding because they can’t fit the criteria for funding and commissioning precisely because they’re small and specialist. We need concerted action that sees funders handing back power to these communities, supporting and resourcing them to define their own needs and solutions in order to develop an autonomous and sustainable BAME led sector. Overall we need to invest in grassroots solutions, developed and owned by the communities they seek to serve. How can art create a less violent society? In what ways does art contribute to violence in society? In what ways does it prevent it? Does art in the criminal justice system contribute to creating a less violent society, or can it do it harm? This year, as part of The Monument Trust Fellowship, the National Criminal Justice Arts Alliance's annual Anne Peaker lecture will focus on art and violence. 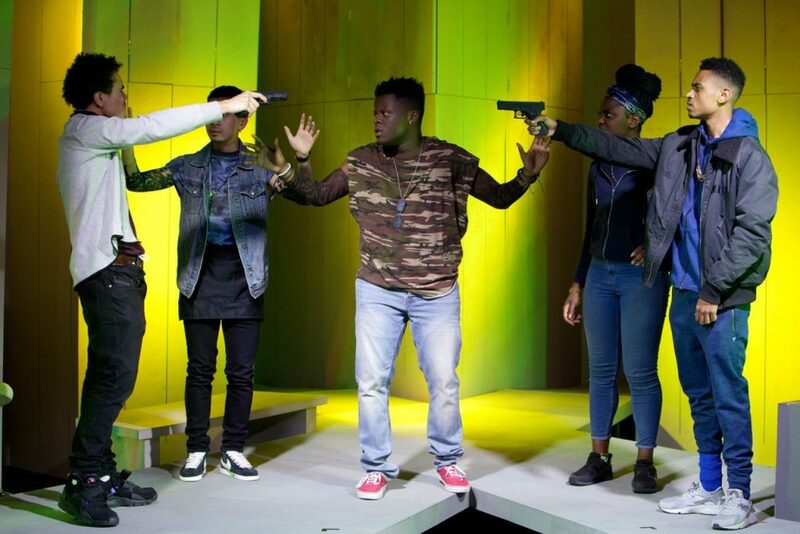 Synergy Theatre Project will also be performing their new play Blackout on the theme of youth violence. The event will run from 6pm- 8pm with networking drinks until 9pm. Spaces are extremely limited so please book in advance. The National Criminal Justice Arts Alliance (NCJAA) is pleased to announce the release of Why do arts in criminal justice matter? The film features responses from sector leaders and supporters - including members of the Monument Fellowship - and shares inspirational accounts of NCJAA members’ work; making a compelling case for arts in criminal justice. "What access to the arts can do is to show you a set of possibilities to how you can live your life differently, and how you can make a really meaningful contribution to society." "If you believe that everybody should be given a second chance – and should not be judged by the worst thing they have ever done – then it’s important that criminal justice can use the arts to change the way people think about offenders." This film was produced as a resource for NCJAA members, please use and share it as much as possible with funders, governors and stakeholders. Watch it above or click here to watch it full-screen. As part of our role in the 7 country-wide Youth Empowerment and Innovation Project (YEIP) our Research and Programme Coordinator, Iman Haji, recently delivered a presentation at the first International Conference on The Prevention of Radicalisation of Young People at the University of Modena and Reggio Emilia in Italy. This international conference marked the launch of the first output of the project, “Young, Marginalised But Not Radicalised: A Comparative Study of Positive Approaches to Youth Radicalisation” a book comprising of seven chapters written in the native languages of the researchers (English, Greek, Italian, Portuguese, Swedish and Romanian) which summarises the key findings from all participating countries. It brought together young people, policy makers, practitioners, politicians and academics from across the EU together to discuss the concept of youth radicalisation, it’s different meanings and forms across Europe as well as potential means of preventing and reducing this phenomenon. Our paper and it’s accompanying presentation shared the methodology behind Khulisa’s programmes, what we have learnt in the last 10 years and how our strengths-based approach to working with young people may be an effective model to prevent and reduce radicalisation and social exclusion. You can view our presentation in the first 15 mins of the video above.